It is time again for the Beauty Blogger Book Club! I know I skipped March and I am sorry. Life was crazy in February and March with the end of gymnastics competition season for my daughter and being in charge of a fundraiser for her school district. The book we read was Me Before You by Jojo Moyes and I highly recommend it! I won't do a full review this time but I suggest you read it! I can't wait to read some other books by this author. 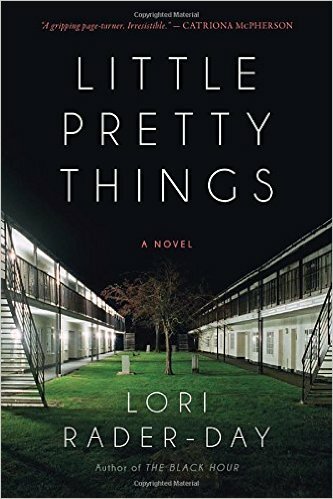 For this past month, the book was Little Pretty Things by Lori Rader-Day. I chose this book for us to read this month after seeing it and reading the synopsis at my local bookstore. It sounded like a mystery/thriller type book without being too freaky and keeping me up at night. In the book, Juliet lives in the same town where she grew up and works at a local motel. One night, her high school best friend comes to town and is found murdered. Of course, Juliet is the prime suspect. In addition to trying to clear her name, Juliet begins to find out that her former best friend's life was not quite what it seemed. While this book was good, I think I had pretty high expectations for some reason ( I keep trying to think of why to tell but I have no clue). By about halfway through, I'd narrowed it down to one of two suspects. There were still quite a few twists and turns as Juliet discovered more secrets from her high school past and that was enough to keep me reading and see how it would play out for the characters. While good, it isn't a book I'd encourage you to run out and buy. If you happen to see it at the library, maybe pick it up and give it a read. For the month of April, Ashly has chosen With Vics You Get Eggroll by Diane Vallere. This is a mystery that looks like a fun read.